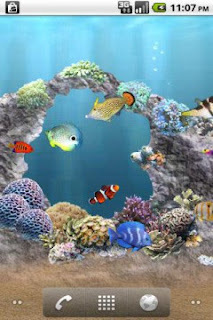 If you’re an exotic fish lover and you adore Android, boy do we have a treat for you. aniPet Aquarium LiveWallpaper gives you the next best thing to having the real deal. This live wallpaper allows you to create your very own aquarium with the ability to choose from 114 different kinds of species of fish. While the developer promises more species will follow, they’ve allowed for up to 15 of your chosen favorites to be displayed at any given time. The application is extremely interactive and is sure to keep your little ones busy in the back seat for those long trips. The app sort of reminds me of those Digi Pets, thanks to the added feature that allows you to feed your fish and watch them grow. You’re fully responsible for the well being of your beloved exotic species. Are you ready for that kind of responsibility? Heck, if your fish survives it to maturity, it can even produce offspring! As you can see, there are a ton of extras with this wallpaper. It’s one of the most interactive and detailed live wallpapers I’ve seen so far. Other features include the ability to change the speed of the fish, how fast they grow, what kind of food you can feed them and even sports the ability to tinker with light animations. Definitely check this one out if you’re a live wallpaper fan. Head on over to our popular apps database for more info and to snag the QR code directly from your smartphone. Don’t forget to let us know what you think of the app in the comments below. Hit the break for a quick video demo and to view more screenshots.